One of the main advantages to driving a truck is the ability to carry a lot of cargo in the bed. The issue of security comes up, though, especially if you often leave your truck unattended. 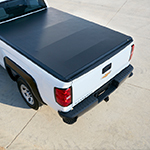 If you want to prevent others from seeing what you have in the bed, you can get a tonneau cover. This can either be a one-piece product or one that comes in multiple pieces that can fold together. Some of these covers can lock, and all of them can protect your cargo from the elements. One of the downsides, though, is that they affect the access to your bed. You have to take some extra time to remove them either completely or partially, and even then they might get in the way. Whatever you end up choosing, remember that you can keep your truck in its best condition by visiting Virginia Select Auto for regular servicing.